We've done it. 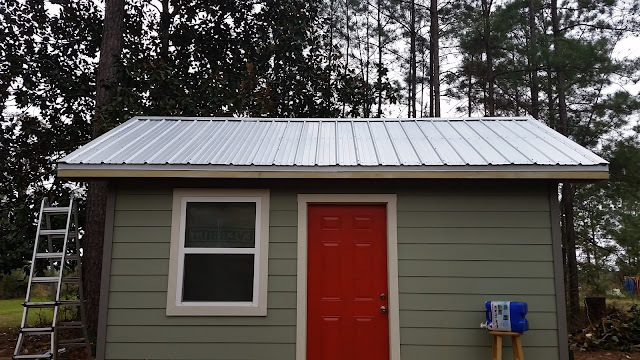 The Turkey Creek Timber, on site office now has a roof! It's one of those jobs that I didn't want to do. 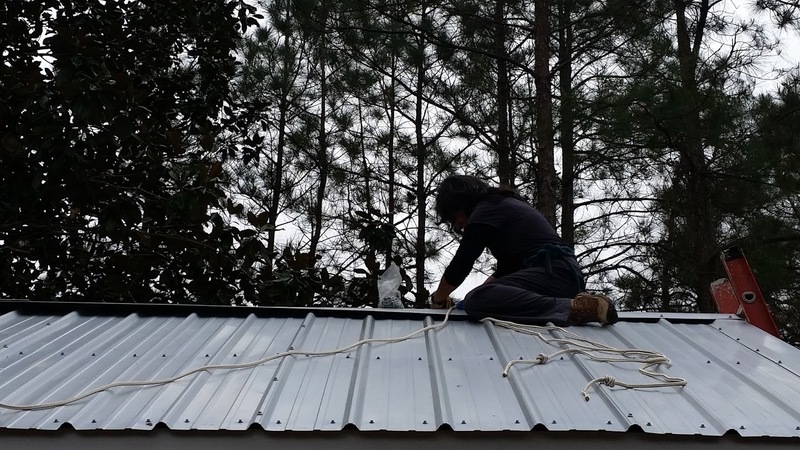 Mainly, it's because I've never installed a metal roof before, but also because the roof is a 6/12 pitch; it is very easy to fall off! I watched a lot of YouTube videos, spoke with several people and lined up two of my adult children to help. So, on Sunday March 12th, 2017, we started the metal roof install. Here's a picture of all of us working on the back side. We made a few mistakes in the beginning, but we finally figured it out. I had to backup the screws along the bottom edge as they weren't catching any "good" wood. The bottom edge is screwed down four inches from the edge. It also took a couple of sheets before we figured out a good pattern for screwing down each sheet. It was a beautiful day. The temperature was great for working outside. We got about half of the back roof done before Abram and Dean had to head back to Houston. Brenda and I were here for the entire week (Spring Break), so we worked on it a little bit each day. By Tuesday we had everything done except for the gable ends and the ridge. The ridge was last. Brenda was a great help. She worked from the scaffolding and I worked on the roof. But, when it came time to secure the ridge; it was Brenda time. We made a repelling seat harness and secured two safety ropes, one for each side of the roof. Thankfully, Brenda never had to test the setup. We did test it before she ventured up on the roof, so we were pretty confident that it would work. Here's a pic of Brenda "screwing up" the roof. We are so very, very happy to finally have a finished roof. One more of those nagging "unattended to task" that's finally been attended to. Here's the finished roof.